Have you ever wondered where some of our town or village names originated from? The majority of the towns and villages local to us have their name or part of it originating from old English or Anglo Saxon language. This is roughly from the time period 400 AD to 1066. The names have altered in spelling or pronunciation over the years to become the local ones we are familiar with today. Think of the familiar names ending in ‘ton’? Barton, Milton, Wotton, Becton? A tun, ton, or tune is the Saxon word for a farm. Barton in the doomsday book of 1086 the name is shown as Bermintune or Beorma’s farm. Wotton translates as being a wood farm. This could be an area of woodland that provides forage for animals. Milton was situated in the centre of an area with other farms in. 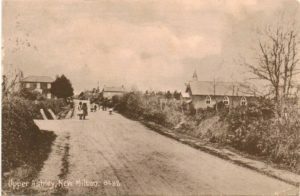 The settlement was called the Middle Ton which over the years became Milton village. The parade of shops, running south from the railway station, were among the first commercial premises in the village. One of the shops was a post office. 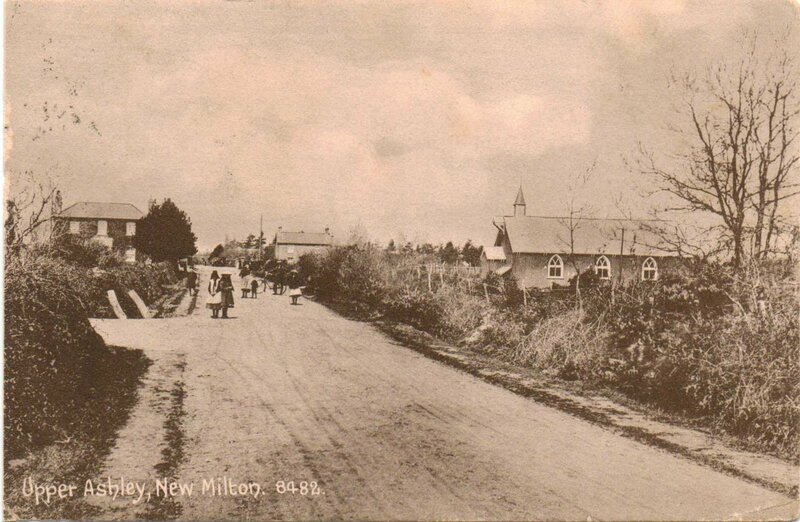 The proprietor, Mrs Newhook, named her post office, the ‘New’ Milton post office to differentiate it with the post office in Milton village. The railway decided to use the same name and called the station New Milton. Ley, (or leah or leigh) is an old English word meaning clearing in the woods or a plain. Ashley is noted in the Domesday book as being called Esselie, or Aesc leah. The clearing in the ash wood. 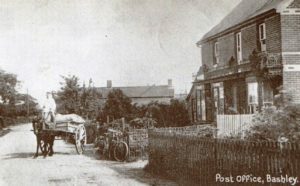 The image seen here is of Lower Ashley in 1918. The origin of the name Bashley is thought to be Baeglocesleah. A wood or woodland clearing belonging to Baegloc. The village of Bashley can trace its history back to Anglo Saxon times when the land was owned by Christchurch priory. This photo shows Bashley village post office and stores which are still going strong today. Let us look at Hordle. This name is recorded as Herdel when written in the Domesday book in 1086. By 1242 it was recorded as Hord –hyll. The old English translation of this name means horde hill. Although a few coins have been found in the area there has never been a hoard located. Sadly the reason behind this name has been lost in the mists of time. The original village or Hordle was much closer to the sea then the present centre. All that can be seen today of the old village are the remains of the church and graves near Taddiford. The names of Silver Street and Golden Hill in Hordle are from Victorian times and do not relate to a potential find of a pot of gold coins. Other local names have less information available about their derivation. The village of Tiptoe derives its name from a French 13th century surname “Typetot”. A member of the “Tibetot” family is known to have held land in the area in the early 14th century. Arnewood is noted in the Domesday book 1086 as Ernemude. It is thought that this derives from Earnawuda, an old English place name which translates as ‘eagles wood’. Finally if we look further away at villages ending with the name ‘hurst’ as in Lyndhurst, Brockenhurst, Ashurst. The ‘hurst part of the name means a wood grove or wooded hillock. However ‘Hyrst’ in old English means a sandbank. The local names in our area have been developing over the centuries and continue to do so even up to quite recent time with the addition of “on-Sea” at Barton and “New” at Milton. As times change it is most likely that the names will also continue to evolve.